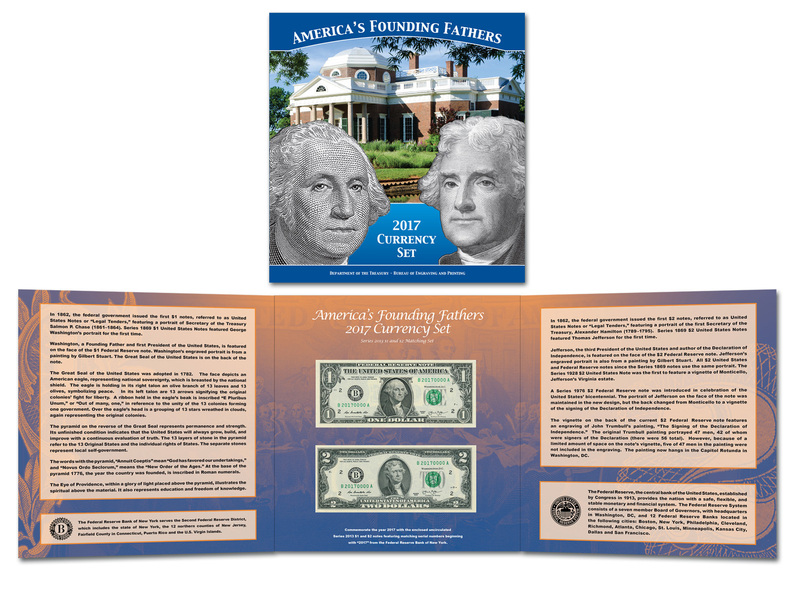 First Day of Sale: March 14, 2017 (8:00 a.m., ET) – The Bureau of Engraving and Printing (BEP) is pleased to introduce the America’s Founding Fathers 2017 Currency Set. Each historic set features a Series 2013 $1 and $2 note from the Federal Reserve Bank of New York bearing the portraits of George Washington and Thomas Jefferson, respectively, with matching serial numbers beginning with 2017. This set is attractively packaged in a tri-fold folder and each note is protected by a clear, acid-free polymer sleeve. A limit of 25 sets per household is in place during the pre-release period (March 14-20, 2017). After the pre-release period expires (March 21, 2017), household purchase restrictions are waived. This set is limited to 5,000 items. Please click here to visit our website for additional product information.